Yes, it’s the revised ISO standard printing conditions for sheet and web fed heatset-offset litho. The revision was published at the end of 2013 and is available from the ISO web site. This blog will look at the main changes to the revised standard and the new data sets and profiles being developed by Fogra for coated and uncoated papers. It will also discuss the implications of the new spectrophotometer specifications, M1, in relation to the new 2013 version and the Fogra data sets. First, papers. These have been revised to better reflect the papers in current use with their high OBA (Optical Brightening Agents), so there are now 4 coated and 4 uncoated paper types in this new version, three more then the old 2004 version. These are now called ‘Print Substrates’ (PS), replacing the ‘Paper Types’ (PT) is the 2004 version. The CIE Lab CMYK, RGB and TVI (dot gain) figures have been amended for each new paper type, in order to reflect the way current presses and Computer to Plate systems and plates now perform. The CIE Lab values relating to CMYK and RBG secondary’s have been slightly revised were the new substrate (PS) is similar to the 2004 version. TVI curves have had a major change to reflect CtP plate making, so a higher dot gain in the highlight area. Also for each substrate type the TVI is the same for all colours. So the black no longer has a differing dot gain curve the CMY. They are still called curves A to E, but are different then those specified in the old 2004 standard. Colour differences are still measured and evaluated using De76, however De2000 tolerance values are also given. I feel this will give a better appraisal of visual differences and is indicative of the move within ISO printing standards to this metric. The new specifications for CIE Lab figures and TVI curves will result in new colour data sets and ICC profiles being needed. At present Fogra are working on a coated profile for PS1, based on a new dataset, Fogra 51 and a uncoated profile for PS5, also based on a new dataset, Fogra 52. The datasets and ICC profiles are still in beta versions, and can be tested, of course at your own risk. They are available on the ECI web site. It is hoped that testing will be complete by the end of 2014. Until then there is no compelling reason to change to the using the new version of the standard. The BPIF ISO 12647 certification scheme will be changed to reflect the new version, but not until the new ICC profiles are out of beta. Of course the BPIF scheme allows ‘customised’ printing conditions so the on-going use of the current ICC profiles and ISO 12647/2 2004 can be accepted, as can the immediate use of the new datasets and ICC profiles for ISO 12647/2 2013. This new version of 12647/2 is much, much, more then just changing to new ICC profiles and new measurement figures. This change also may need new lighting, new spectrophotometers and changing digital proofing papers to have OBA/UV content. The changeover to this new version does have the potential to clause confusion and error if not managed correctly with the commitment and resources needed. One of main factors as referred to above for this new version of 12647/2 is to reflect the use of OBAs in papers. With this in mind the viewing and lighting conditions standard, ISO 3664 was revised in 2009 in order to support the extra UV emissions caused by the OBA content. So this is now within the standard and the latest D50 tubes will meet this requirement. Please see my blog. However to measure accurately printed sheets a new spectrophotometer measurement standard is needed, M1. The 2004 standard uses M0 measurements, which do not correctly record the UV content of the paper, so can affect the accuracy of the ink colour readings. The M1 spectrophotometer measures and allows for the UV content caused by the OBAs. So an M0 reading giving b at -4, on reading using M1 would result in a more accurate b -6. Older spectrophotometers will not be able to read in the M1 mode; so some updating of instruments is inevitable, both to off-line handhelds and on-press online devises. Current ‘approved’ inkjet proofing papers are often OBA free. Proofing papers for the new profiles and M1 spectrophotometer readings will need to match the OBAs in the chosen paper type as closely as possible. Fortunately there are a number of inkjet semi matt papers in photo market that will meet this need. Until the new profiles are out of beta, as referred to above, not a lot. If you have time, it may be useful to test the beta profiles, look at plans to update your spectrophotometers, plan your revised colour management workflows and research the change in inkjet proofing papers. However there will be an ‘interesting’ change over period. 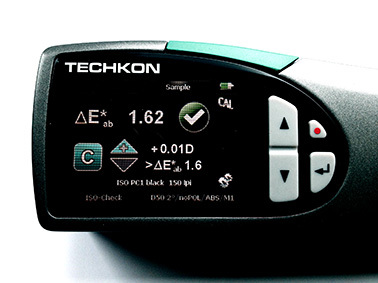 The existing profiles, Fogra 39/47 etc., based on M0 readings may prove difficult to proof and match on press if using tubes with the new 2009 D50 specifications or the new proofing papers with OBAs. I guess this change may take years rather then months. With the standard changing it will also be interesting to examine how images with the older CMYK profiles with print using the new standard. Will they need to be re-profiled using Device Link Profiles. Then factor in the latest US GRACol 2013 profiles based on draft ISO 15339 standard and ANSI CGATS.21-2 Characterization Reference Print Condition (CRPC) datasets which will be specified by some US based multi-nationals, then we are really living in interesting times! The CRPC 6 coated papers dataset and CMYK profile should be similar to a Fogra 39/51 based profile. How we may deal with these areas of differing printing standards and profiles ’interoperability’ will be the subject of another blog! Paul Sherfield who runs the consultancy is well known in the printing and pre-media industry as having considerable knowledge on digital workflows, with a special expertise on the business reasoning behind such systems. He has installed some of the most successful digital pre-press and pre media systems in the UK. For 2 years he worked on a number of medium term projects before starting the consultancy in July 2000. Before this he was a partner in what became one of the leading pre-press/printing companies in London. He is active in a number of industry groups including the BPIF Technical Standards Committee, ISO TC 130 printing standards committees and is chair of the BPIF steering group for ISO 12647/2 UK certification, He is a regular speaker at seminars and conferences.